A list of Frequently Asked Questions about the 2018 Lehigh Valley Cider & Wine Festival at Coca-Cola Park. When is the 2018 Lehigh Valley Cider & Wine Festival? Saturday, October 15th at Coca-Cola Park with two sessions available (12-4 p.m. for Session 1 and 6-10 p.m. for session 2). For directions to Coca-Cola Park, please click here. What is the 2018 Lehigh Valley Cider & Wine Festival? The 2018 Lehigh Valley Cider and Wine Festival is an on-field event featuring hard cider and wine tastings from local and regional cideries and wineries. Attendees each receive a collector’s stemless glass to enjoy their cider and wine tastings and can also purchase a variety of food and crafts from local food trucks, vendors and artisans. The festival also includes live entertainment, the ability to purchase cider and wine by the glass, bottle or case and other fun activities such as an apple launch competition. Interested parties are encouraged to purchase their tickets today as the previous years events sold out in advance. 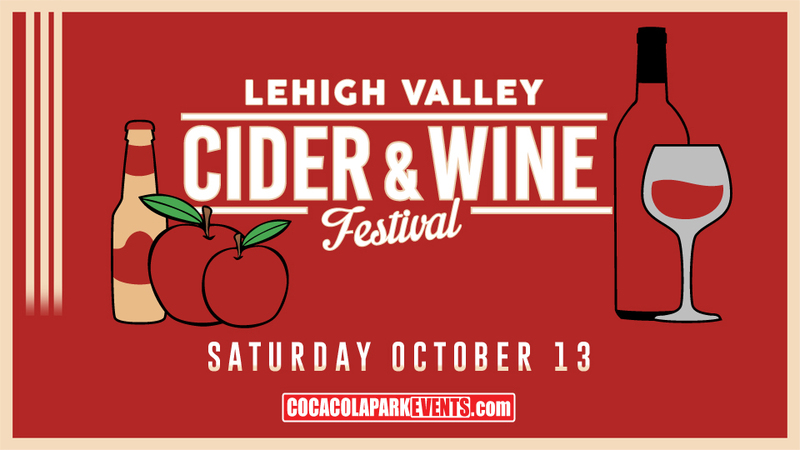 Lehigh Valley Cider and Wine Festival tickets for both Saturday sessions are on sale now starting at $35 per person for a four-hour tasting from 12 p.m. to 4 p.m. for session one and from 6 p.m. to 10 p.m. for session two. VIP tickets are $45 per person and include a one hour early entrance time (11 a.m. for session one and 5 p.m.. for session two) and a five-hour tasting. For just $5, tickets are available for designated drivers who will receive complimentary soda or for those just wishing to visit the various food vendors and artisans. Interested parties are encouraged to purchase their tickets in advance as there will be an additional $5 charge on all tickets purchased on the day of the festival, based on availability. To purchase your tickets or for more information, scroll to the bottom of the page, call (610) 841-PIGS (7447) or visit the Coca-Cola Park ticket office during normal business hours (Monday-Friday, 9 a.m. to 5 p.m.; Saturday, 10 a.m. to 2 p.m.). Unlimited tastings from the cideries and wineries along with a collector's tasting glass. Food and non-alcoholic beverages are available for purchase. Will the ticket office be open on the day of the festival to purchase tickets? Yes! The Coca-Cola Park ticket office will open at 10 a.m. on the day of the event. Please note that sessions in previous years' events sold out in advance. Parking is complimentary for the Lehigh Valley Cider and Wine Festival. Attendees are reminded that there are three entry points for parking and are encouraged to use the Dauphin Street entrance when traveling from downtown Allentown. In addition to the Dauphin Street entrance, entry to Coca-Cola Park can be gained off American Parkway and Union Boulevard. Preferred/Handicapped Parking access is available via American Parkway only. For the safety of our guests, only service dogs will be permitted at this event. Is outside food or beverage permitted at this event? No. Per Coca-Cola Park policy, and for the safety of all guests in attendance, no outside food or beverage will be allowed. Do I have to be 21 years of age or older to attend? Yes. No children of any age will be permitted at this event. You must also be 21 or older to attend if purchasing a Designated Driver ticket. Yes! Performers for the event will be announced soon. Can my winery, cidery or business participate in this festival? Vendors looking to participate in the 2018 Lehigh Valley Cider and Wine Festival should contact the Lehigh Valley Cider and Wine Festival at www.LVCiderandWine.com/contact.